In the quest for easy, naturally gluten free dinners, a simple stir fry was one of the first meals we added to our menu in the Ginger Lemon Girl household! It was easy, quick, incredibly tasty, and quite frugal. My husband and I both work full time, but are working very hard to pay off our home and other debts. In order to pay things off to meet our goals in a timely manner we have to carefully budget for groceries and household items. When I first went gluten free, grocery budgeting was incredibly difficult. I bought many specialized “gluten free” convenience foods because I did not realize there was a much easier and more frugal way! This meal is one very inexpensive meal if you are able to buy chicken on sale. Frozen packages of stir-fry vegetables are also quite cheap and stretch your meal a long way! This meal makes 4-6 servings for the two of us. It means we have enough extra food for lunches or leftovers, which is wonderfully convenient. Cut chicken into small bite-size pieces. Heat 1 tablespoon of olive oil on medium high heat in a large non-stick skillet. Saute chicken until golden brown for 3-4 minutes on each side. Heat remaining olive oil and sesame oil in pan. Add frozen vegetables, ginger, and salt & pepper. Cook for 5-10 minutes on medium high heat. Vegetables should be bright and crisp. Add chicken back to skillet and heat through. Sprinkle toasted sesame seeds on just before serving. Serve immediately over 1/2 cup hot, steamed brown rice. ** MAKE SURE to purchase stir fry vegetables that do not have any added sauces or spice mixes, as they may not be gluten free. ** You can also use soy sauce if you would like, I do not use it because many soy sauces contain wheat and I also have an allergy to soy! 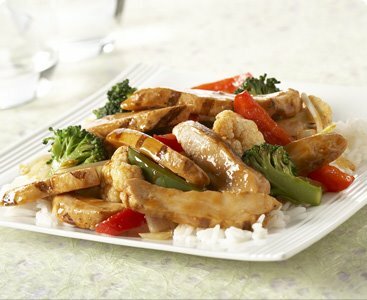 We have thoroughly enjoyed this stir fry without additional sauces! But if you do use soy sauce or another asian sauce, make SURE that is gluten free! ***Erin here: Our best sale prices for chicken is $1.77/lb. Prices vary all over the country! Always be on the lookout for the lowest prices on your favorite meat cuts and stcok up and freeze when on sale! I went gluten and sugar free this year and have actually loved it. Here are some of the things I do – I eat rice, corn, corn tortillas, barley, sweet potatos, squash or white potatos instead of wheat . I also buy rice crackers, Ryevita, and all-rye bread (most rye products have wheat in them, so you have to look carefully). I use pasta made from brown rice. None of these things is particularly expensive. Most of my dishes feature fish/meat and vegetables, plus one of the above to make me feel “full.” I also use a lot of spices, lemon, cinnamon, garlic etc to add interest to every dish. And I eat a lot of hummus, which I usually make every week — and often take with veggies and rice crackers for lunch. One of my favorite lunches, too, is hummus on rye toast with a slice of fresh tomato. Incredibly tasty, very filling and a perfect lunch when accompanied by fruit. Because I’m also allergic to cane sugar, I’ve added honey and real maple syryp to my diet to use on cereal, in tea or coffee, or to sweeten desserts. (I tried stevia and some other sweeteners, but I just didn’t like them.) I also keep bags of frozen fruit in my freezer to supplement fresh fruit and so I always have something to sate my sweet tooth when I really need it. Frozen mango works great and Trader Joe’s has reasonably priced frozen fruit. My allergies are not terrible, so when I go out to eat I allow myself to fudge a bit — maybe I’ll have a half piece of bread or a small portion of pasta. But 98% of my meals are wheat and sugar free — and I really don’t miss the bread, which I thought I’d never be able to say. The can sugar is harder, but I’m still 95% sugar-free. One other thing — I’m trying to develop an all-rye bread recipe that I can make at home, maybe even in my breadmaker. Does such a recipe exist? I have not tried to make an all-rye bread, or seen a recipe for one. I suggest googling it or trying recipezaar.com or allrecipes.com. Remember that rye is not gluten-free. Gluten is in wheat, rye, and barley. Erin, I make your chicken stir-fry, but I use 3 T. of honey and 3 T. of soy sauce (gluten-free), no sesame oil or seeds, or ginger. My gluten-free daughter thinks it’s delicious. I also use instant Uncle Ben’s brown rice. I’m all about trying this. My husband and daughter love Asian foods but we can’t trust soy sauces where we can’t read the ingredients. Also they are missing out on terriayki (sp) now too. Awesome recipe. I was just looking for a gluten free sir fry recipe and viola.